If you or a loved one was injured as a result of injury on a construction site, our South Florida private investigators can investigate the injury accident and we may be able to recommend a Florida Workers’ compensation Attorney that we work with to assist you with your case / claim. In Florida, the laws provide benefits for employees injured at work. If you were hurt on the job and your employer has more than four full-time or part-time employees in Florida, you may be entitled to benefits such as physical therapy, medical treatment, indemnity benefits (portion of your lost wages), prescription medication reimbursement, mileage for medical related travel expenses, as well as other benefits that are available. Our private investigators can assist you with your case; call us today to see how. If you are a case manager, attorney, plaintiff, or employer that believes that a worker is filing a fraudulent workers’ compensation case we are here to assist you. We have been completing investigations in South Florida for over two decades, CTK INVESTIGATIONS, LLChas assisted and investigated thousands of work related injury accidents annually. Our private detectives in Florida understand that every employer in the state is required to maintain a safe work environment for employees. They are also required to ensure their employees are compensated when an accident does occur. Workers can suffer a variety of injuries such as neck and back pain, soft tissue injuries, broken bones, traumatic brain injury, and in some cases death. Our private investigators and the South Florida Workers’ Compensation attorneys we deal with understand the Florida Statute and we can investigate the potential for liability in any construction or work related injury or accident. Our investigation can reveal if there is the potential for a third party claim or if there is workers’ compensation immunity: either vertical or horizontal. In construction or work related injuries and accidents, we hear the following question on a daily basis, “How much is my case worth?” The short answer is… every case is different. The Florida Statute does not state that the insurance carrier or your employer are under any obligation to settle your case or claim, therefore there is no guarantee of a tax free settlement. That being said, we work with claimant’s attorneys on a daily basis that have successfully handled and litigated tens of thousands of work and construction related injuries and accidents, and we can possibly recommend an attorney for you. According to the Florida Department of Financial Services, there were 58,412 workers compensations cases in 2007. The average settlement in 2007 was $10,180, the average benefits were $12,414, and the average medical was $8,153. Many factors determine the settlement including but not limited to age, average weekly wage, expected future wages, type of job, type of injury, future medical care that is now required, as well as your level of education and training. After investigating work related and construction accidents for many years we recommend that if you were injured on the job, you notify your supervisor as soon as possible about your injuries. If you have any questions about your construction or on the job injury, call us today for a FREE consultation. If we are unable to answer your question, we may be able to recommend a South Florida workers’ compensation attorney to assist you with your case or claim. Your employer and their insurance carrier should notify you of your rights and have you treated by a workers’ compensation physician. To assist with the investigation and processing of your claim, as well as to keep your memory fresh, our private investigators recommend that you take notes about you case. Note who you spoke with at your company, what time it was who was present. What was faxed, who received the fax, any claim numbers assigned any case managers that you come in contact with, as well as any circumstances you believe were contributory to your work related or construction accident. See our Workers’ Compensation FAQs for more information. 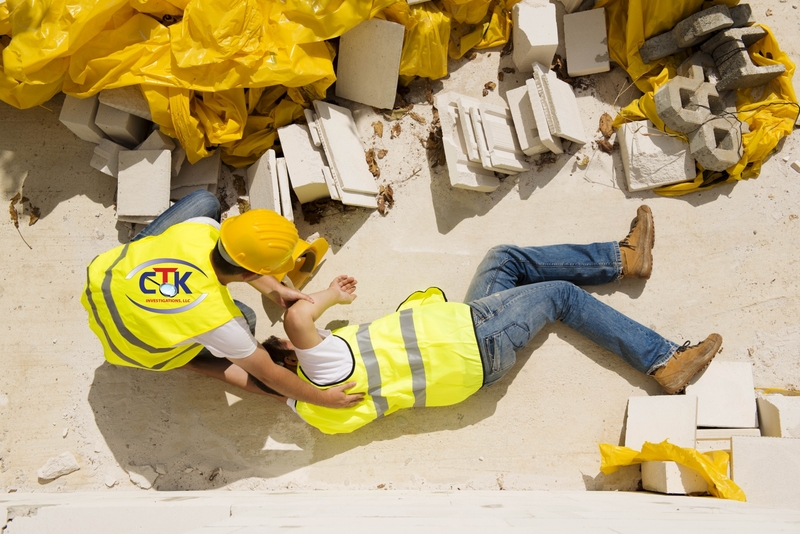 If you or a family member were injured as a result of a construction accident in Florida or hurt at work, contact, CTK INVESTIGATIONS, LLC today. We are available 24 hours a day, and offer a FREE consultation to review your case. Let our family protect you and your family.